CD6 is a type I transmembrane glycoprotein that contains a 24-amino acid signal sequence, three extracellular scavenger receptor cysteine-rich (SRCR) domains, a membrane-spanning domain and a 44-amino acid cytoplasmic domain. 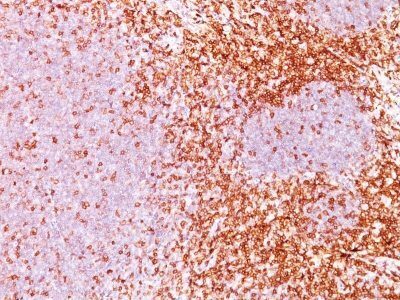 CD6 is a type I transmembrane glycoprotein that contains a 24-amino acid signal sequence, three extracellular scavenger receptor cysteine-rich (SRCR) domains, a membrane-spanning domain and a 44-amino acid cytoplasmic domain. The CD6 glycoprotein is tyrosine phosphorylated during TCR-mediated T cell activation. CD6 shows significant homology to CD5. 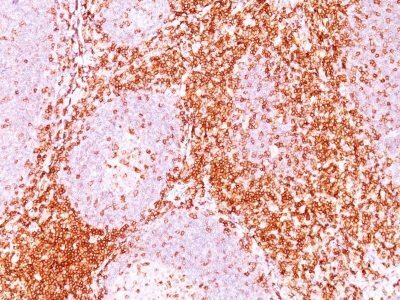 CD6 is present on mature thymocytes, peripheral T cells and a subset of B cells. Antibodies to CD6 are used to deplete T cells from bone marrow transplants to prevent graft versus host disease. Catalog number key for antibody number 0428, Anti-CD6 (3F7B5) The prefix indicates conjugation, followed by the antibody number and size suffix.